For those unfamiliar with the Marvel universe, a brief synopsis follows. The most powerful artifacts in the Marvel movies are the six “infinity stones.” Each stone is associated with a specific power. Anyone holding an infinity stone is the bearer of immense power, often enough power to destroy an entire planet with the mere blink of an eye. 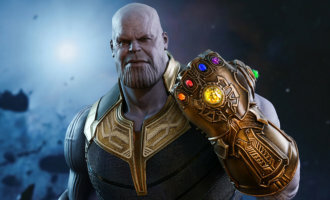 Thanos, the villain of the movie, is an all powerful evil entity on a quest to accumulate all the stones and wield them in his special glove, the “infinity gauntlet.” Thanos acquired the stones one at a time, growing more powerful and insidious in the process. On a distant planet, a handful of Marvel heroes devised a plan to remove the Infinity Gauntlet from Thanos. In the process of fighting Thanos, Peter Quill, a Marvel Hero, also known as, Star-Lord, played by Chris Pratt, is interrogating Thanos as to the whereabouts of his teammate and love interest, Gamora. Because of Star-Lord’s unrestrained passions, Thanos escaped the trap the Avengers set for him, acquired another infinity stone, and continued his quest in acquiring the final infinity stones. Had Star-Lord been able to control his unruly passions, the Avengers could have removed the infinity gauntlet from Thanos’ hand. They could have potentially ended the conflict with Thanos and saved the universe. Unfortunately, Star-Lord’s passions got the best of him, and Thanos accomplished his sinister mission. The notion that Man must restrain his passions and appetites, and the consequences that ensue from our failure to do so, is the pith of the liberal arts and the liberal arts curriculum. To understand how this conclusion is reached, a working definition of the liberal arts is necessary. The liberal arts is a term from the ancien regime of France prior to the French Revolution (Sewell, Jr., 1980). The liberal arts were diametrically opposed to the mechanical arts, which were, “Commercial as well as manufacturing occupations” (Sewell, Jr., 1980, p. 21). The mechanical arts were, “considered to be a form of manual labor and therefore to be base. They were ‘mechanical’ as opposed to the intellectual or learned ‘liberal arts’” (Seawell, Jr., 1980, p. 21). On the other hand, “the liberal arts-defined as those arts ‘whose productions appertain more to the mind [esprit] than the hand’-were ranked above the mechanical arts- defined as appertaining ‘more to the hand than mind’” (Seawell, Jr., 1980, p. 23). “This conception of art differs importantly from the romantic nineteenth-century notion of art as the expression of creative genius unbounded by the conventions of ordinary life. Quite the contrary, art was not a matter of originality, inspiration, and genius but of rules, order and discipline” (p. 22). The notion of unruly passions and appetites latent in Mankind emanates from the Judeo-Christian ethic which believes in the fallen nature of Man (Sewell, Jr., 1980). Man’s nature is corrupted due to Original-Sin, and that corrupted nature necessitates restraints. This is the purpose of the liberal arts: a higher spiritual labor emphasizing rules and restrictions to channel our appetites and passions. Without these channels, our passions and appetites will run amok. For Babbitt, restraint was the “the highest and most difficult task” (1986, p. 100) for a person to attempt. Restraining our passions and appetites is a struggle for every human being, young and old, weak and strong. Man’s nature is beastly and unruly. Freedom is only beneficial when balanced with an equal dose of restraint. The liberal arts are supposed to inculcate this notion in our hearts and minds. The liberal arts are there to teach us our virtues and vices. They act as the “controlling power upon will and appetite” (Burke, 1791) that teach us our nature and our limitations. As Claes Ryn, a scholar of Irving Babbitt, once addressed the issue as, “Man’s true humanity lies in his ability to put checks on his desires” (1997, p. 32). The epitome of human action is our ability to resist our evil inclination; self-control is the hardest thing for a person to do. Babbitt quoted a Buddhist proverb to display the concept of restraint as a guiding principle in our lives: “‘if one man conquer in battle ten thousand times ten thousand men,’ says the Buddhist proverb, ‘and another man conquer his own self, he is the greatest of conquerors’” (Babbitt, 1986, p. 101). Had Star-Lord been capable of conquering himself, he could have ascended to hero status and become one of the universe’s truly legendary men. Like Star-Lord, “Napoleon showed his energy by conquering Europe; he would have shown his will if at the critical moment he had been capable of curbing his own lust for power” (Babbitt, 1986, p. 101). Star-Lord, like Napoleon, fell victim to his own unrestrained passions and appetites. Unfortunately, Star-Lord was incapable of restraining his passions. Thanos acquired all the infinity stones for the infinity gauntlet and accomplished his evil mission. With the snap of his fingers, Thanos made half of the universe disappear via disintegration. Among the disintegrated was none other than Star-Lord himself. This is where the writers of the movie missed an opportunity. Star-Lord disintegrated with half of the universe because of his unrestrained passion and rage; this outcome could have been readily avoided. While it was not exclusively his fault, he still bears much of the responsibility for the genocide of the universe. He should have remained to deal with the consequences of his actions. By disintegrating him, Star-Lord was able to evade the guilt, problems, and repercussions of his rage. Star-Lord was given the easy way out. Without Star-Lord’s presence, we are incapable of empathizing with the suffering he should be experiencing. With Star-Lord’s absence, we are less able to learn the consequences of unrestrained passions and appetites. The audience needs to comprehend these lessons. Without great works of fiction, we can learn these life-lessons, but we will only learn them through great agony. Ultimately, the writers of Infinity war missed the opportunity to engage the audience on a deeper level. Yes, without question, the special effects are remarkable and visually stunning. The production value reaches fantastic heights. The story of good vs. evil is timeless and constant. Yet despite these positive attributes, this is a missed opportunity. The writers had the prospect to elevate the status of the movie from an entertaining night at the box office, to a place of metacognitive reflection that could resonate with the audience. This type of reflection is not just something that has value in the short-term, but is something valuable that we, as the audience, can keep with us long after the movie’s credits have rolled. As Felton (2011) spoke of Agamemnon, a classic of the liberal arts curriculum, “the one enduring, universal law is that knowledge comes by suffering. Men learn discretion only by the ‘torturing recollection of woe’” (p. 57). By disintegrating Star-Lord, the lingering injustice Thanos inflicted on the universe is only felt via the third person, meaning the audience. Star-Lord should remain to help rectify the fallout of his unrestrained passions because, “an injustice you aim to correct had better be seen not from the point of view of the victim, but from the perspective of the agent who commits the injustice” (Bromwich, 2014, p. 17). Should Star-Lord have remained in the picture, we, as the audience, would have experienced a greater emotional investment, and a teachable moment. As Ryne once affirmed of great works of literature: “In them we meet ourselves and all other human beings” (Ryn, 1997, p. 153). Star-Lord’s absence will prohibit our ability to see ourselves in the character, especially his flaws and shortcomings. Star-Lord was unable to reign in his unruly passions and appetites. In the liberal arts, we are constantly reminded of Man’s unruly and fallen nature, and how that nature necessitates restraint. When the restraints on our passions and appetites are removed, we become our own worst enemies. In Avengers: Infinity war, Star-Lord’s uncontrolled anger wronged not just himself and his close teammates, but it cost the lives of half the universe. Star-Lord should have remained in the film to deal with the consequences of his unrestrained wrath. Unfortunately, the writers chose to eliminate him from the film, at least in the short-term (the sequel to Infinity war airs in April of 2019, so what happens there may contradict what is written here). The writers deprived the audience of a deeper emotional connection relating to the empathy generated from Star-Lord’s shortcomings. Star-Lord’s suffering should be all of our suffering, but sadly, the writers failed to provide the audience with this emotional connection. His passions forged his fetters. Truth be told, his passions should have forged our collective fetters, but alas, this missed opportunity will forever confine Avengers: Infinity war to the status of simply another movie. Infinity war can never elevate itself to a higher caliber of cinema, so long as the audience is incapable of forming a deeper connection and attachment to the story. Babbitt, I. (1986). Literature and the American college. Washington, DC: The National Humanities Institute. Bromwich, D. (2014). Moral Imagination: Essays. Princeton, NJ: Princeton University. Kirk, R. (1986). Introduction. In I. Babbitt, Literature and the American college (pp. 1-68). Washington, DC: National Humanities Institute. Kirk, R. (1981). The moral imagination. Literature and Belief. Retrieved from http://www.kirkcenter.org/index.php/detail/the-moral-imagination/. Ryn, C. (1978). Democracy and the ethical life. Baton Rouge, LI: University of Louisiana. Ryn, C. (1997). Will, imagination, and reason: Babbitt, Croce, and the problem of reality. New Brunswick, NJ: Transaction Books. Sewell, Jr., W. (1980). Work and revolution in France: the language of labor from the old regime to 1848. New York, NY: Cambridge University.